The output operator for the Matrix class. For the time being 'double' is the only type supported. are of course supported. These are implemented without using GSL functionality, and thus binary read and write to streams are not supported. All GSL matrix related functions are not implement but most functionality defined for GSL matrices can be achieved with this interface class. Most notable GSL functionality not supported are no binary file support and views on arrays, utility::vectors, gsl_vectors, diagonals, subdiagonals, and superdiagonals. This constructor does not initialize underlying (essential) structures. Constructor allocating memory space for r times c elements, and sets all elements to init_value. If r is zero c must be zero and vice versa. GSL_error if memory allocation fails. A GSL_error is indirectly thrown if memory allocation fails. Constructor from a matrix expression. A matrix expression is result operator+, operator-, and operator*, or combinations of them. where B, C, and D are all instances of class Matrix. Typically this constructor is not used, if rvalues are enabled. Missing values, i.e. empty elements, are treated as NaN values (std::numeric_limits<double>::quiet_NaN() to be specific). Matrix rows are separated with the new line character. Column element separation has two modes depending on the value of sep. If sep is the default '\0' value then column elements are separated with white space characters except the new line character. Multiple sequential white space characters are treated as one separator. Setting sep to something else than the default value will change the behaviour to use the sep character as the separator between column elements. Multiple sequential sep characters will be treated as separating elements with missing values. End of input is the end of file marker and this treatment cannot be redefined using the provided API. GSL_error if memory allocation fails, IO_error if unexpected input is found in the input stream. Set all elements to value. Iterator iterates along a row. When end of row is reached it jumps to beginning of next row. iterator pointing to upper-left element. const_iterator pointing to upper-left element. Iterator iterates along a column. iterator pointing to first element of column i.
const_iterator pointing to first element of column i.
Iterator iterates along a row. iterator pointing to first element of row i.
const_iterator pointing to first element of row i.
Elementwise division of the elements of the calling matrix by the elements of matrix b, . The result is stored into the calling matrix. Check whether matrices are equal within a user defined precision, set by precision. True if each element deviates less or equal than d. If any matrix contain a NaN, false is always returned. A const pointer to the internal GSL matrix. A pointer to the internal GSL matrix. Multiply the elements of Matrix b with the elements of the calling Matrix , . The result is stored into the calling Matrix. Comparison operator. Takes squared time. Checks are performed with exact matching, i.e., rounding off effects may destroy comparison. Use the equal function for comparing elements within a user defined precision. False if all elements are equal otherwise true. Reference to the element position (row, column). If GSL range checks are enabled in the underlying GSL library a GSL_error exception is thrown if either index is out of range. Const reference to the element position (row, column). Const reference to the resulting Matrix. Multiply the elements of the left hand side Matrix with a scalar d, . Elementwise addition of the elements of Matrix b to the left hand side Matrix , . 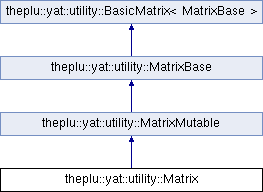 A const reference to the resulting Matrix. A reference to the resulting VectorMutable. Add the scalar value d to the left hand side Matrix, . Elementwise subtraction of the elements of Matrix b to the left hand side Matrix , . Subtract the scalar value d to the left hand side Matrix, . If lhs needs to be resized, views and iterators are invalidated. Assignment from a matrix expression. A matrix expression is the result of operator+, operator-, and operator*, or combinations of them. where A, B, C, and D are all instances of class Matrix. True if all elements are equal otherwise false. All elements are set to init_value. Swap columns i and j.
GSL_error if either index is out of bounds. Swap row i and column j. The Matrix must be square. GSL_error if either index is out of bounds, or if matrix is not square. Swap rows i and j. Unless matrix is square, views and iterators are invalidated. GSL_error if memory allocation fails for the new transposed matrix. Check if all elements of the Matrix are zero. True if all elements in the Matrix is zero, false otherwise. Get the maximum value of the Matrix. The maximum value of the Matrix. Get the minimum value of the Matrix. The minimum value of the Matrix. Locate the maximum and minimum element in the Matrix. The indices to the element with the minimum and maximum values of the Matrix, respectively. Lower index has precedence (searching in row-major order). Create a Matrix flag indicating NaN's in another Matrix templat. The flag Matrix is changed to contain 1's and 0's only. A 1 means that the corresponding element in the templat Matrix is valid and a zero means that the corresponding element is a NaN. Space for Matrix flag is reallocated to fit the size of Matrix templat if sizes mismatch. True if the templat Matrix contains at least one NaN. Elementwise addition of the elements , . Exchange all elements between the matrices by copying. This function swaps element by element and matrices must have the same size. References and iterators are not invalidated. GSL_error if sizes are not equal.